The 7th New Overseas Chinese Innovation and Entrepreneurship Achievement Exchange Conference of All-China Federation of Returned Overseas Chinese was held in the Great Hall of the People on June 15th. Professor Ji Hong of Northwest A&F University won the second prize of the “Chinese Overseas Contribution Award”. Professor Ji Hong is the chief expert of the Ankang Fisheries Experiment Demonstration Station of NWAFU, the Vice Chairman of the Federation of Returned Overseas Chinese of NWAFU, the Vice Chairman of the branch of China Association for Promoting Democracy and the Deputy Director of the Standing Committee of Yangling District People's Congress. Professor Ji Hong has been rooted in Qinba Mountain for more than ten years since returning from overseas. 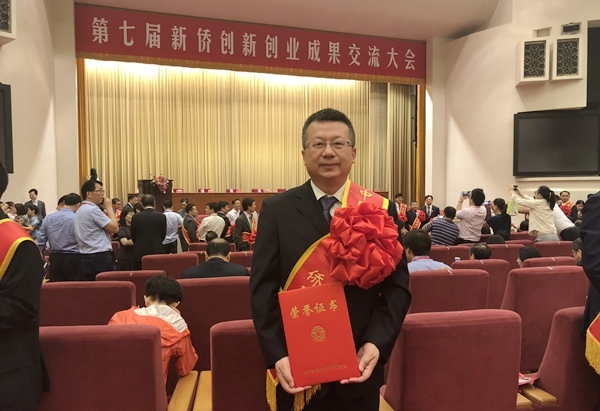 He has made outstanding contributions to the social and economic development of the local region in assisting the poverty alleviation by industry of Ankang through technology, promoting the development of the fishery industry and environmental protection of Ankang.